At first glance, opportunities for new providers to grab significant ad revenue generated by linear, multi-channel video would seem promising. 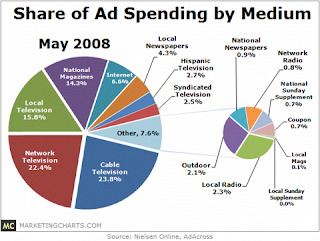 According to Nielsen Online, about 24 percent of current ad spending goes to cable television. So telcos ought to be able to tap a significant share of that revenue at some point, the logic would be. The issue is that most of the cable television ad revenue is captured by programming networks, not by cable companies. Cable companies get about seven percent of their revenue from advertising. If one looks at the share of online video ad revenue, Internet gets about seven percent. Same issue there: nearly all that revenue is earned by application providers; very little by ISPs. Comcast will cap Internet usage of its broadband subscribers at 250 Gigabytes per month starting Oct. 1, 2008. Typical users will not be liable for any hard caps, at that level. Comcast says median usage these days for its residential customers is about two to three gigabytes a month. To trigger the cap, a user would have to be watching a fair amountof video. Comcast says the cap would be hit if users watched 125 standard-definition movies. Assuming a two-hour average movie duration, that works out to about 250 hours of streamed video, equivalent to eight hours a day, 30 days a week. That could get to be an issue at some point, but few human beings have time to watch that much streamed video and do much of anything else related to work, school, exercise or friends. So far, the only users already "close" to the 250 Gbyte cap are less than one percent of heavy movie downloaders, one suspects. Comcast says less than one percent of its current users are "even close" to 250 Gbytes a month of usage. European Union telecommunications Commissioner Viviane Reding does not like the way some mobile operators are charging by the minute rather than second for calls made while traveling between EU countries. Mobile operators obviously don't relish the thought of new rules that would force them to bill in seconds or fractions of minutes. . In France, Spain, Lithuania and Portugal, operators have to bill by the second, but national legislation is not practical for roamed calls, the Commission spokesman said. The EU has already adopted a law to cap the price of roamed voice calls for three years, with the cap due to be lowered on Saturday and in August next year before the law expires in 2010. The EU is expected to renew the caps for another three years in October, and also might introduce new caps on text messaging charges when users are roaming. EU nations and the European Parliament would have to approve the changes. Competition in the wired network broadband space is currently about as good as it’s going to get for the foreseeable future, and could even backslide, according to Blair Levin, Stifel Nicolaus analyst. That accords with the thinking of analysts at the Phoenix Center, who have argued for some years that robust competition between cable and telcos, while not as good as having more facilities-based competitors, is as much as can be expected in the U.S. market, and offers the practical hope of delivering competitive benefits to users, despite hopes for more. “Prospects for the long-heralded ‘third pipe’ appear dim and dimming,” Levin says, as reported by Telephony Online. There has been no shortage of possible contenders over the last 30 years. Wireless always tops the list. Then there are the electrical utilities, municipal networks and broadband-over-powerline technology, none of which have made much of a dent. One wag quips that "wireless is the technology of the future, and always will be." But Clearwire appears set on building a facilities-based, national third pipe. And fourth-generation networks, overall, might shift share away from wired alternatives, many believe. “The market is as competitive as it is ever going to be, as far as we can see," says Levin. At least on the wired network side of the ledger, that likely is true. 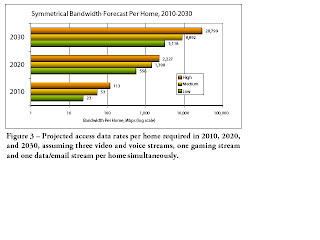 But Levin says 4G wireless rollouts in 2010 or 2012 could represent a significant change in the competitive landscape. 100 Mbps Wireless Broadband by 2010? Mobile broadband could hit 100 Mbps before fiber to home access is widely deployed in many markets, according to the GSM Association. Japan and South Korea, as early as 2010, might be followed by access at those sorts of speeds in the European market by 2012. That doesn't necessarily mean wireless broadband will be a fully-functional substitute for fixed broadband for every application. It does point out that the "race" to enhance fixed network broadband speeds is important for competitive reasons beyond the tactics of competing wired network providers. One more example that the demarcation between "network" and "user premises" steadily is being erased, in the office or the home, AT&T has launched a nationwide "Geek Squad" or "Firedog" service for customers in all 50 States, whether they are AT&T customers or not. The “ConnecTech” service will help consumers configure computers, set up networking, and install home theaters and mount TVs. Prices range from $69 for basic remote troubleshooting of a PC or home network support to $179 for at-home support. Those are flat-rate prices, not per hour. It can cost $849 for a technician to mount a flat-panel TV over 32″ on a wall, connect audio and video components, conceal cables in the wall as construction allows, and demonstrate to how to use the whole system. A simple PC set-up, where the tech hooks it up to a home network, downloads updates to Microsoft Windows and hooks up your printer will cost a flat-rate $119. An Apple Mac set up costs $159. In the world of IP communications and digital devices, no service provider forever can ignore the need to operate on both sides of the network interface or firewall. Comcast has a new plan to deal with bandwidth hogs: slowing down their broadband access connections for periods of 10 minutes to 20 minutes, at peak congestion periods. Comcast hasn't yet offered a definition of what a "heavy user" is or how much bandwidth consumption qualifies one as a "heavy user." At some level this is a marketing opportunity for fiber-to-home networks that should be able to operate without such restrictions. At another level, "heavy users" probably are not profitable customers at this point. Not only do their subscription fees not cover their consumption of network resources, but they also create problems for other users. Still, the longer-term issue is that the usage profile of a "heavy" user today becomes more like the "normal" usage profile at some point in the future, when most people use the Internet to watch video. Long term, there is but one reasonable alternative: much more bandwidth for every user. In the near term, there are some serioius marketing issues to grapple with. Though the overwhelming percentage of users will never encounter the traffic shaping, the existence of such shaping then becomes a potential marketing drag for some, an opportunity for others. But it is a complicated matter. In truth, competitors probably are happy "heavy" users are Comcast's problem, as such customers are not profitable, and in fact create externalities. It isn't just the stress on the access networks. Comcast pays transit fees for all those video bits. So higher usage really does impose usage-based costs. This will be an interesting marketing challenge for Comcast and its competitors. Longer term, it also is a packaging and pricing challenge, since most users ultimately will wind up consuming lots more bandwidth as video becomes a staple of Internet activity. AT&T has announced a guaranteed broadband access monthly rate for two years without the hassle of a term commitment. The plan freezes rates for two years and does not have any termination fee. New residential AT&T high speed Internet orders placed before Nov. 15 will include the price guarantee. Given the shockingly low net high-speed access additions AT&T, Verizon and Qwest experienced in the second quarter, it is a smart move. There are times when the way things get counted tells you something about where products are growing, how companies want their growth measured and how revenue growth metrics are changing. That seems to be the growing case for video entertainment. 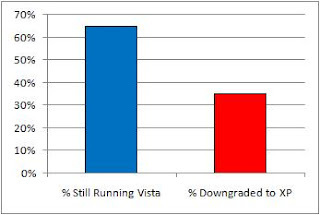 Until recently, "basic subscribers" have been a fairly reasonable way to evaluate how well a video provider is doing. Two decades ago, that might have been a reasonable way to evaluate how well a telco was doing. But markets are changing, and so are the "counting" mechanisms. This data from the Cable and Telecommunications Association for Marketing track "digital video" in addition to basic subscribers. At some point, we might well find that digital video subscriptions are a better indicator of performance than "basic" subscriber units, where in the past the delivery protocols haven't mattered as much (satellite subscribers are, by definition, digital customers). These days, "revenue generating units" make more sense as a way of describing either cable or telco growth. About a decade ago, "voice grade equivalents" began making more sense than "access lines" as a way of describing and measuring performance. It looks like we are just on the cusp of a time when digital video units are a better growth metric than "basic" and "enhanced" or "digital cable" subscriptions. For whatever reason, large numbers of users still seem to be expressing a preference for XP. Phweet, a new application that allows Twitter exchanges to escalated to voice, now is in public alpha. One of the more unusual features is the ability to create on-the-fly, unscheduled conference calls. Basically the app works using shortURLs. A signed-in Twitter user can ping other Twitter user and request escalation to voice. The other user receives a shortURL. When clicked, a voice session is created using a simple click-to-talk operation. Twitter addicts may like this. For all the other good things executives at AT&T, Verizon or Qwest might talk about, these figures are the one thing you find not being talked about. Analyst Sees Trouble for Emerging Telecom Cos.
Oppenheimer analyst Timothy Horan this morning turned cautious on the “emerging telecom sector," cutting his ratings on both Level 3 and Cogent Communications to "underperform" from "perform," while chopping TW Telecom to "perform" from "outperform," according to Barron's writer Eric Savitz. Horan says slowing demand and decreases in pricing power at Cogent and Paetec Holding are evident. Horan says that while the sector has already been under pressure, the companies are heading for a “difficult six to nine month period.” Slowing or sluggish economic growth tends to lead to slackened demand for communication services, an increase in churn, pricing pressure, slower volume growth and limited access to capital as well. Of course, some of us would say we can't recall a year in the past eight when the "emerging" telecom sector was not "under pressure." Pressure is just a way of life in the competitive segment of the business. Indeed, in every segment of the business. Worldwide revenue from hosted VoIP and managed IP PBX services jumped 52 percent to $24 billion in 2007 after surging 66 percent in 2006, and is expected to grow in the strong double-digits through at least 2011, say researchers at Infonetics Research. 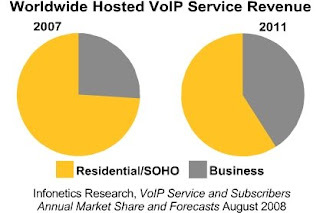 The number of worldwide residential and SOHO VoIP subscribers grew 60 percent between 2006 and 2007, to over 75 million, with the largest gains in North America and Europe, the Middle East, and Africa, although Asia Pacific still leads. Business customer share of worldwide hosted VoIP service revenue will increase from 26 percent in 2007 to 41 percent in 2011, Infonetics says. Comcast is North America’s largest consumer VoIP service provider, with 20 percent subscriber market share, while France Télécom leads in the EMEA region. Softbank leads in Asia Pacific, and Cableco and Vono Brazil are neck and neck in Central and South America. “While VoIP services are being embraced by consumers worldwide, businesses have been comparatively slower in their adoption due to various roadblocks," says Matthias Machowinski, Infonetics Research directing analyst. All that is about to change, though, as Session Initiation Protocol interfaces and SIP trunking services now are available. Growth Anomalies: Trend or Blip? It is way too early to determine an actual trend, but there have been some anomalies this quarter. Dish Network, Cogent Communications and Verizon experienced what appear to be "first ever" declines in traffic or customer additions. If market share shifts are all that is involved, that's one thing. If something else is going on, that might be more worrisome. It's one thing for market share to shift among competitors in a given segment. It would be quite something else again if aggregate demand in a market is slowing. And that might be happening. It just is too early to say. Cogent Communications, for example, experienced a first-time, three orders of magnitude shift in traffic growth for the months of April and May. Where Cogent traditionally has seen growth rates over the past five years of about 120 percent a quarter, it saw in the second quarter negative growth of one percent. Cogent CEO Dave Schaeffer says the industry might now be at a point where traffic no longer can be driven by either broadband access penetration growth or even faster access speeds. "We’ve seen a proliferation of broadband connectivity where we now have almost 80 percent broadband penetration in the Western world," says Dave Schaeffer, Cogent CEO. Line rates on those mass mile connections have increased to close to five megabits of download speed which is sufficient for most applications particularly video"
"You’re not going to get an uplift from more broadband penetration or greater download speed," he says. "What you need are more applications that consumers want to use more and more." "Many applications that people point to could migrate to the Internet or increase and not materially move the needle because the base is large," he says. So what about video? Sure, video is driving traffic, he says. There are applications that will drive growth and we’ve been pretty clear that this is really video we see that with a number of customers and we see that trend continuing. "But we have not seen the massive migration of video consumption over the Internet, he says. "Today video is consumed about 4.5 minutes a day on the Internet and television, which is traditionally delivered by a broadcast satellite, cable or DVD, is consumed 4.5 hours a day," Schaeffer says. 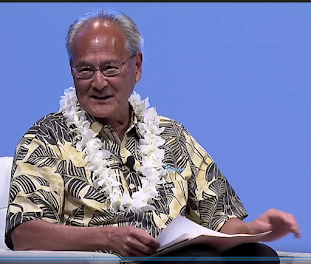 Until that viewership pattern changes, "we will see slower growth," he adds. "The Internet is not going to decelerate, it’s not going to go away but it is going to be a bit lumpy in the way in which it reaccelerates," he says. There were some anamolies in the data this quarter. It bears watching. T-Mobile's site for @Home, the dual-mode service allowing use of the home broadband access service as the connection for T-Mobile mobile service, was the fastest-growing Web site in the month of July, growing at a 4447 percent rate, according to Compete. It looks like T-Mobile's @Home service is getting some interest. Some observers think wireless broadband accounts will outnumber wired broadband accounts at some point. If you assume a significant percentage of wireless subscriptions are of the broadband variety, that is possible. If there are about 350 million wired broadband lines, then about 19 percent of wired lines are of the broadband variety. If that ultimately grows to about half of all lines in service, then there might be a billion or so wired broadband lines in service. If just 30 percent of the world's wireless accounts are broadband, then there will be more than 1.5 billion wireless broadband accounts in service at that point. In 2007, third generation and fourth generation wireless network subscriptions grew 94 percent. By the end of 2012, 3G/4G subscriptions are expected to rise to 1.4 billion, say researchers at In-Stat. CableVision Systems Corp. now finds that more than 37 percent of its customers buy a voice product. If CableVision has 68 percent penetration of homes in its market, that means it has gotten more than 25 percent share of the voice market. 20 Mbps Services Get Traction in U.K.
Virgin Media's 20-Mbps U.K. broadband service seems to be seeing strong consumer interest. Over the last 12 months, Virgin Media has seen an 82 percent increase in the number of subscribers taking the 20 Mbps service, up to this point the fastest tier of service available, though Virgin Media now is adding a 50 Mbps service as well. 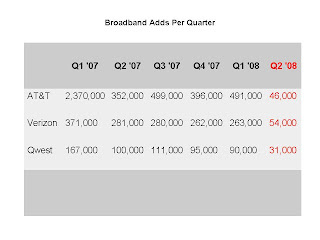 About 9.3 percent of Virgin Media's broadband access subscribers buy the 20 Mbps service. Virgin Media also has found increasing numbers of customers upgrading from 2 Mbps to 10 Mbps levels of service. The percentage of Internet users who use search engines on a typical day has been steadily rising from about one third of all users in 2002 to a new high of just under one half (49 percent), say researchers at the Pew Internet & American Life Project. To the extent that email has been the closest thing to an Internet killer app, search is emerging as the second. The number of those using a search engine on a typical day is pulling ever closer to the 60 percent of Internet users who use email on a typical day. 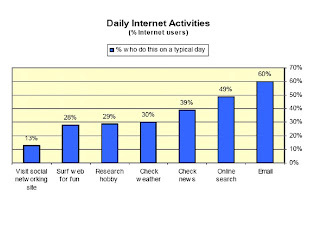 The percentage of internet users who search on a typical day grew 69 percent from January 2002 to May 2008. During the same six-year time period, the use of email on a typical day rose from 52 percent to 60 percent, for a growth rate of just 15 percent. There now are three times more mobile subscribers than access line subscribers worldwide in 2007 (3.3 billion vs. 1.1 billion), say researchers at Infonetics Research. The firm also expects continued strong growth in mobile subscribers, mainly driven by basic voice service needs in BRIC countries (Brazil, Russia, India, and China). The number of mobile subscribers jumped 31 percent in 2007 over 2006, while access line subscribers declined five percent. The number of worldwide mobile subscribers will reach 5.2 billion by 2011, Infonetics further suggest, while mobile broadband subscribers grow at a 104 percent compound annual growth rate from 2007 to 2011. 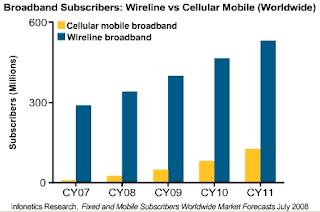 At that point, there will be one cellular mobile broadband subscriber for every four wireline broadband subscribers. Since consumers are not sold on mobile video services, mobile service providers should try offering users free content to prime demand, say researchers at Parks Associates. While nearly one third of U.S. households have a video-capable mobile phone, operators are struggling to find an audience for their mobile video services, according to John Barrett, Parks Associates research director. In the U.K. market, as in the U.S. market, the number of likely new customers for broadband access services is dwindling. In the U.K., there now are about a million dial-up users left. "The number of dial-up homes ripe for migration to broadband is rapidly dwindling, there are barely a million of them left now and they are an increasingly resistant minority," says Tim Johnson, Point Topic chief analyst. There are about 16,735,000 broadband lines already in service, and it would be reasonable to expect a sharp deceleration in 2008. For the 12-month period from June 2006 to June 2007, nearly three million new subscribers were added. Between June 2007 and June 2008 about two million were added. With just about one million dial-up subscribers left to convert, it seems unlikely the gross additions will hit even a million between now and June 2009. There are 9.6 million households without Internet access at all, but that includes homes with no PCs as well as homes with users who do not use the Internet. Point Topic estimates 58 pecent of U.K. households use broadband, about 4.5 percent use dial-up while 37 percent have no access. Economic woes might be having some effect, but the primary issue is market saturation. Netflix has never given a breakdown on the number of subscribers in each type of rental plan, but using Feedflix, a site set up to allow Netflix users to track their usage of Netflix, some guesses can be made. According to Netflix’s latest earnings report, they currently have 8.4 million subscribers. By extrapolating Feedflix’s breakdown of Netflix service plans to the larger subscriber base, we get the following estimates on where customers are spending their money, according to an investment advisor who goes by the pen name of Davis Freeberg. Since heavier users cost Netflix more (more postage, more DVD rentals, more handling), one would assume the profit is generated by the lighter users who rent less (less postage, fewer rentals, less handling cost). VoIP now represents close to 30 percent of all telephone subscriptions in France, according to French regulatory authority ARCEP, and is growing by about one million subscriptions every quarter. 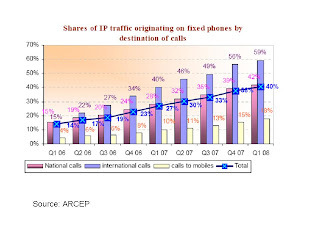 IP calls now represent 40.5 percent of traffic originating on fixed phones(compared with less than 27 percent a year earlier) and 59 percent of traffic for international calls. VoIP traffic now represents 42 percent of in-France calling and 18 percent of traffic to mobiles. VoIP services are generally used more intensively (5 hours and 34 minutes) than “traditional” telephone service (3 hours and 16 minutes) per subscriber, per month in the first quarter of 2008. Most fixed lines (66 percent) in service represent a single “traditional” telephone subscription on the PSTN, dropping by three percentage points each quarter. The reduction primarily is caused by customers substituting VoIP services. Some 15 percent of lines in service at the end of the first quarter 2008 support both VoIP and legacy telecom. Text messaging is now, and will still be, the top revenue-generating mobile data application in 2011, say researchers at Informa. Video is the application that will have the fastest growth rate between now and 2011, though. AT&T expects to modify the way it packages its broadband Internet service, offering more precise levels of service that promise minimum and maximum transmission rates. AT&T Senior Vice President Robert Quinn told the Federal Communications Commission the company would offer "non-overlapping tiers" of broadband service, rather than its current offerings which go "up to" varying speeds of data transmission. "When we provide broadband services based on speed, we will do so in discrete tiers that are disclosed to our end-user customers," Quinn said. Quinn said the changes were among "clarifications and improvements" AT&T plans to make to its customer disclosure policies, which the company hopes to roll out later this year. "If we find that we are not providing service within the ordered speed tier, AT&T will take action either to bring the customer's service within the ordered tier or give the customer an option to move to a different tier," Quinn said. If Web-based applications are to have a true shot at displacing apps run off local hard disk drives, response time issues must be solved. As is typical for Web apps, though, new tools may help solve that problem. Comet (or Reverse AJAX), for example, is a significant departure from the “click-and-wait” interaction we traditionally associate with Web applications. In fact, as with so many innovations--recall "push" technology or "application service providers"--timing is everything. Some applications that simply were too cumbersome 10 years ago now are possible with the spread of broadband, faster broadband, caching, peer-to-peer and software such as Comet. Being right often is less "good" than being timely. Comet is said by its supporters to resurrect push capabilities with better IP communications. Simply put, push communications like Comet remove the requirement for an end user to explicitly click on a link or button to request information from a server. Instead, the server is free to send messages to clients anytime a server-side event occurs. Therefore, content no longer needs the tried and true “click” to reach you. Web pages from hereon out will simply update as new data is made available, finally laying to rest the refresh button on your browser. That has implications for bandwidth usage profiles, bandwidth intensity and usefulness of interactive or social applications. Comet makes it possible to build any application that requires real-time updates, enabling true desktop-like functionality to be delivered over the Internet. That has implications for the effectiveness of chat applications, social networking, online games; news updates and online collaboration, for example. User-generated video will continue to account for close to half of total online video streams between 2008 and 2013, but disappointingly will produce no more than four percent of ad-related online video revenue at any time during this period, acccording the Diffusion Group. While the business of online video remains immature, Buckley notes that the continued growth in online TV viewing among consumers and the push to get this content directly to the TV will cultivate the larger audience for professional online video content. H.R. 5788, "The Halting Airplane Noise to Give Us Peace Act of 2008," was approved by the House Transportation and Infrastructure Committee on Aug. 31, 2008. That does not necessarily mean anything much. It is just a committee vote, and the legislation is not yet scheduled for a floor vote, much less for consideration by the Senate. But some of us agree that people talking on mobiles can be quite an annoyance in the now-cramped confines of aircraft. The European Union, though, seems to be moving ahead on inflight cellular service. Leslie Cauley, USA Today staff writer, says AT&T got a one-year extension of its exclusivity deal for iPhone sales in the U.S. market as part of the new deal with Apple to pay an upfront fee, rather than a share of monthly recurring revenues. The original exclusive deal was set to expire at the end of 2009. So AT&T has another two and a half years to wring more magic out of the iPhone before contending with other carriers. The iPhone might seem like a no-brainer now, but back then it was little more than a concept, with no name, design plan or software operating system. And it was offered by a computer company that had zip experience in wireless. And credit AT&T CEO Randall Stephenson for making a key, and somewhat "un-telco-like decision." in staking so much on the Apple deal. "We're not betting on the handset," Stephenson says. "We're betting on Jobs." That appears so far to have been the right decision. It isn't just the handset. It was the intuition that Steve Jobs, whose firm never had built mobile phones before, could bring something spectacularly new to handset design, and by extension to the mobile data business. Imagine any stodgy, old school CEO at a firm that big, betting on a person, rather than a company track record. It's a sign of new thinking, for sure. Continental Research estimated in April 2006 that Vonage had about six percent share of VoIP usage in the U.K. market, which is heavily skewed towards PC soft clients. But Vonage U.K. seems these days to be focusing on several user segments with higher propensity to use landline replacement services. A key segment is users with frequent needs to call the United States, says Vincent Potier, managing director, Vonage U.K. But change could be coming. It is possible that customers will be able to buy a "naked DSL" service in the U.K., in the future. That will be important since 75 percent of broadband customers in the U.K. use DSL. Still, the European VoIP market really was defined by Skype. Users expected to use headsets and make occasional calls on a scheduled basis, especially when calling internationally. So Vonage has had to position itself as a different sort of experience: a replacement for the landline. Up to this point that has been a bit of a marketing challenge as U.K. users must buy a bundled voice line when buying DSL. So the opportunity for cost savings is not as great as would be the case in a "naked DSL" environment.